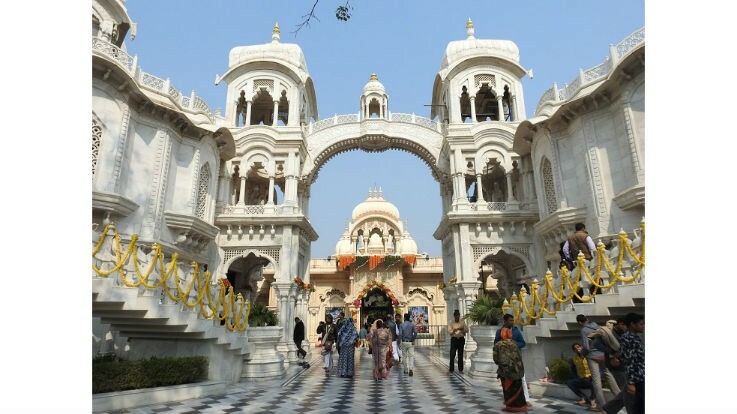 Located at Raman Reti in Vrindavan, Uttar Pradesh, ISKCON temple is a spectacular white marble structure which is also known as Krishna- Balram Temple. The temple was built in 1975 on the banks of Yamuna River, where Lord Krishna and Balaram used to graze cows. The magnificent Iskcon Temple comes across the sight, as one enters the holy land of Vrindavan. The sanctum of ISKCON temple is reached through a square courtyard, lined by a columned passageway decorated with bright murals depicting episodes from Lord Krishna’s life. The tamal tree in the courtyard is the same one under which Radha used to wait for Krishna every evening. Devotees sing bhajans in praise of Lord Krishna. The aarti at this temple is electrifying with devotees singing and dancing to the chant of Hare Krishna to the accompaniment of dholak and cymbals. The temple complex also houses the ISKCON community hall to hold seminars on Krishna bhakti, a tourist information office, a restaurant as well as a guest house. Adjoining the temple is the Samadhi of Shri Prabhupadji, the founder of the ISKCON.  ISKCON was established by Swami Prabhupada in 1966. The aim of the society was the general well-being of humans and to popularize the teachings of the Bhagwad Gita as well as the Vedic scriptures. They are credited with the construction of 6000 temples. The first ISKCON Temple was built at Vrindavan in 1975 and inaugurated on the occasion of Ram Navami. He supervised the development of the temple. After his demise, his body was laid to rest near the temple, and the place is now referred to as the Samadhi Mandir. 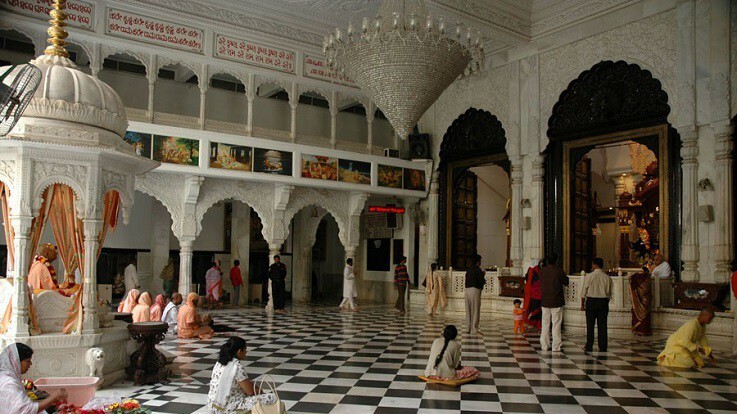 The temple complex was extended further to accomplish the vision of Swami Prabhupada which houses 'Samadhi' of Bhaktivedanta Swami Prabhupada made from white marble. It is the place where the body of Swami was kept after he left this world. The temple complex has been divided into various sections, where religious activities are carried out. The spiritual ecstasy and divine aura of Krishna-Balaram Temple attract devotees from all over the world. The chief deities of the temple are Krishna-Balrama, which stands under the central column of the temple. The images of Gaura-Nitai and Radha-Shyamsundar are located alongside the central shrine. The temple galleries adorn various pictures of Lord Krishna, depicting frolicking scenes of his life. Every day various ceremonies and rituals are performed at the temple. Festivals such as Janmashtami, Rama Navami, Purnima, Diwali, Annakut, Chandan Yatra, Jhulan Yatra, Kartika Purnima, Balaram Purnima, Radhashtami and Govardhana Puja are celebrated with great devotion. Janmashtami, the birthday of Lord Krishna, is observed with fervor. The temple is decorated with flowers, ribbons, and garlands. People keep fast for an entire day and at midnight; they take a grain-less meal. The deities are dressed up in beautiful clothes and dazzling jewelry. The temple organizes various Aratis including Samadhi Arati, Mangala Arati, the Tulsi Arati, Dhoop Arati, Raj Bhog Arati, Pushpa Arati, Sandhya Arati, Shayana Arati at different times of the day. Within the temple premises, Bhagavad Gita classes are also held in the mornings as well as in the evenings. 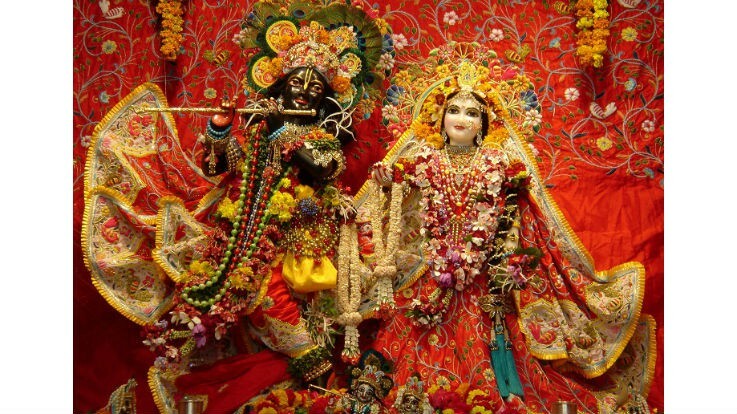 Best Time to Visit ISKCON temple is between October and November. By Road: Tourists can also get buses from Delhi to Vrindavan or take an auto from Chatikhara town to Vrindavan. By Train: Mathura (141 km) is the nearest railway station. From Mathura, the temple is 10 km away. Trains are available from Mumbai and Kolkata to get you to Vrindavan.